HANCOCK COUNTY, Ind. 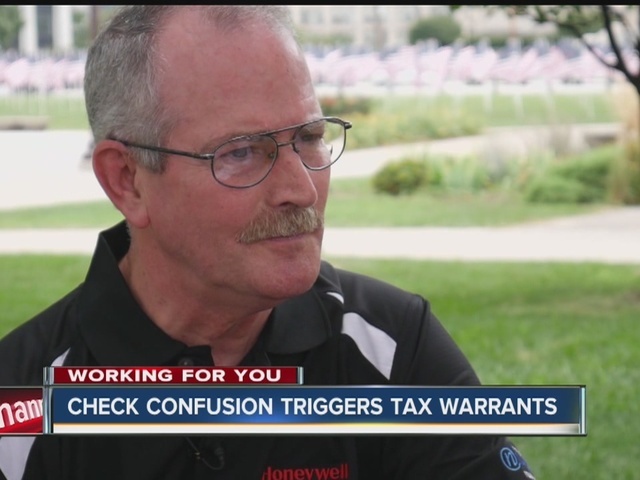 -- A Hancock County family who received a tax refund by mistake ended up receiving tax warrants. Based on his 2016 tax return, Tyler Glenn ended up owing $395 to the state of Indiana. He received a $50 check from the Indiana Department of Revenue. Printed on the check were the words, "TAX REFUND." He didn't cash the check. "It wasn't my money," he said. He called the Department of Revenue, hoping to get it sorted out. Instead, he received a notice, demanding a payment of $50.32. The problem: When the Department of Revenue sends you a refund check, the state automatically considers you cashing it. Even if you don't deposit it. If you get a check by mistake and don't mail it back, then you owe the state money. "I chose to be honest and call them and tell them that I think they made a mistake," Glenn said. The state then issued a tax warrant through Hancock County. The state put a lien on the title of his wife's new car to get the uncashed $50, plus interest. Glenn also received a letter, a new tax warrant. He was charged $83.54. "I have spent countless hours writing letters and making phone calls and it shouldn't have happened to begin with," he said. "I'm pleased they pursue tax offenders like they did me," he said. "Except I'm not one of them." The good news: All the warrants have been recalled and the issue over the $50 has been wiped clean. If something like this happens to you, know you can't call the Department of Revenue and ask the agency to cancel a check received by mistake. You should return the check in person, or reseal the check and write "Return to sender" on it.